In their recent global study, McKinsey quantifies what smarter sales people, content marketers & online PRs have known for a while: the traditional purchase funnel – which gets narrower as consumers progress down it from awareness to action – is not valid anymore. In reality, consumers act differently. McKinsey’s research, which covers more than 20,000 people over 5 continents, shows that just before people are ready to buy they enter stage of ‘active evaluation’. In this stage, the funnel actually widens as people actively research and consider all the options before making their final purchase decision. This has major impacts for your online marketing communications tactics. Think about it. People at the ‘active evaluation’ stage of their decision making cycle are the closest to buying. So it makes sense to focus there rather than at the start of the funnel, right? They do not want, or respond to, advertising, so why advertise? People at that stage want valuable, meaningful information that helps them with their decision. So why not give it to them? Content marketing & online public relations helps you reach & move those people! If you have adopted a content marketing & online pr approach you will already know this. You’ll know that when you publish & promote valuable content such as white-papers, videos & blog posts that do not push your product or service, but talk authoritatively & objectively about the various options available to consumers in the ‘active evaluation’ stage, you are perfectly positioned to help them with their final decision. For example, you could publish & promote a side-by-side comparison of you & your competitor’s services or products, a list of pros & cons, or even an overview of the market. By doing this you are building trust & loyalty with your prospects even before purchase. That’s quite a head-flip! So here’s the point. Content marketing & online pr is not advertising. It is about giving. It is not mass communications. It is about focusing on specific people at specific stages of their buying cycle. It’s not product or service centric. It is consumer centric. It is about creating brand Loyalty & Trust through providing relevant & meaningful content at the time when people need it the most. So you can help close that sale. McKinsey have a nice overview of the change in the purchase funnel here. 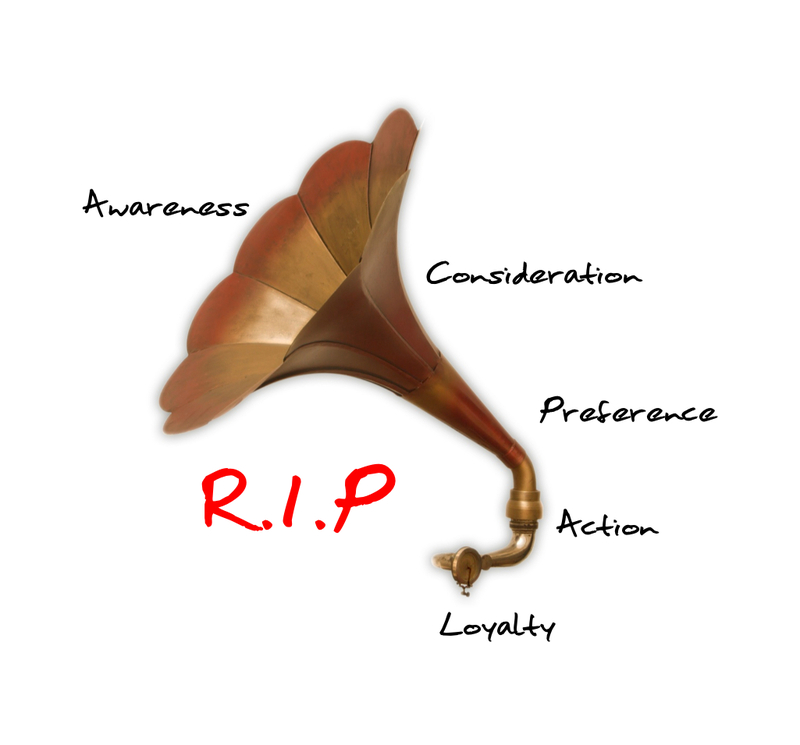 My business partner Michiel, blogs about the changes in the funnel here. I believe the impacts are huge for online marketing communications. Maybe this is the fuel to the fire that finally positions content marketing as intrinsic to the sales process.We’ll see.